As two-time Newberry Award-winning author Lois Lowry suggests, what others makes of her work is a natural transformation from what she originally envisioned, which is another way of saying that we each have a unique point-of-view and gift to share with the world. In Eric Coble's adaptation of Lowry's heralded 20-year old work, The Giver, we visit a future community in which history has been off-loaded to one person, pills are used to curb desire, and a Committee of Elders observes and determines the role that each coming-of-age young adult will play for the rest of his or her life. Lowry wrote this as her father was suffering from memory loss, a condition that shows up in her dystopia as a community-wide malaise by design: everyone except the Keeper of Memories lives in a pharmacological haze, with a set of left-brain pre-defined responses that are as bland as their monochromatic grey world. 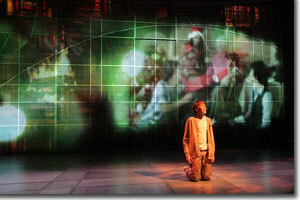 Jonas (Alastair Hennessy), the 12-year old protagonist, and his friends anticipate the Ceremony of the Twelves, where they will be assigned the roles they are to perform for the rest of their working lives. Consider and compare this to a Native American vision quest, or yogic rebirthing, and there you have the difference between self-directed discovery (every being is the center) and top-down, hierarchical power-tripping. After Jonas is selected for a very special role, he begins to see his community in a much different light. Director Christy Montour-Larson does wonders with the young actors—Hennessy, Aliza Fassett (Lily), Brynn Gauthier (Fiona), and Evan Sullivan (Asher)—teeing up impressive performances from the adults: Timothy McCracken (Father), Diana Dresser (Mother), Billie McBride (The Chief Elder) and Philip Pleasants (The Giver). McCracken and Dresser share the identical vein of mellifluous prescription-induced "sameness," perfectly modulated emotionless verbal expressions, extolling the virtues of suppressing any feelings that can't be logically defined. Is this a dystopia, or an allegory examining the conceptual shortcomings and arrogance of our current "thought leaders," the self-described "New World Order" (a term used by both David Rockefeller and George H.W. Bush to describe the power elite) and their minions, the technocrats overseeing various vassal industries, governments, and programs? McBride's clear-headed cameo leaves no doubt that the Elders are a cut above in the empowered department, though as we discover, holistic wisdom is in as short supply among them as it is with our own power elite. As the title character, Pleasants embodies a remarkable synthesis of wisdom and compassion, despite living with the pain of collective memories that span recorded history, and a secret regarding the previous youth assigned to take over as the Keeper of Memories. Lowry's vision stimulates a number of questions, particularly regarding our instincts, our ego, and our desires: to what degree can we release ourselves from the tyranny of these forces and be free, or are we doomed to suppressing these forces, at the cost of our freedom? Or can we, as many before us, learn to transcend these lower self imperatives? 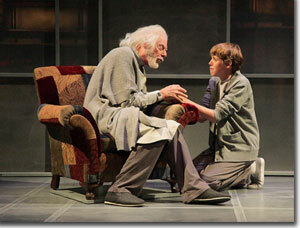 The Denver Center Theatre's presentation of The Giver runs through November 18th. For tickets: 303-893-4100 or www.denvercenter.org.